Cost of living in Phnom Penh is anywhere between 25 per cent to 50 per cent less in Cambodia than Australia, depending upon where you live and how you live. Joanna, who lives in Phnom Penh, always pops down to have her hair washed and blow dried before she goes out. And why not? It costs $12. That would be closer to $45 in Australia. The cost of living in Phnom Penh is anywhere between 25 per cent to 50 per cent less in Cambodia, depending upon where you live and how you live. In the capital., Phnom Penh, grocery prices are 40 per cent lower, restaurant prices are more than 70 per cent cheaper, rent is almost 75 per cent less in Phnom Penh, and a beer is 80 per cent cheaper. Ted, a restaurentaur, agreed: ‘Booze is ridiculously cheap, cigarettes are cheap.’ Going to a restaurant for dinner and drinking a good bottle of French red is cheap. 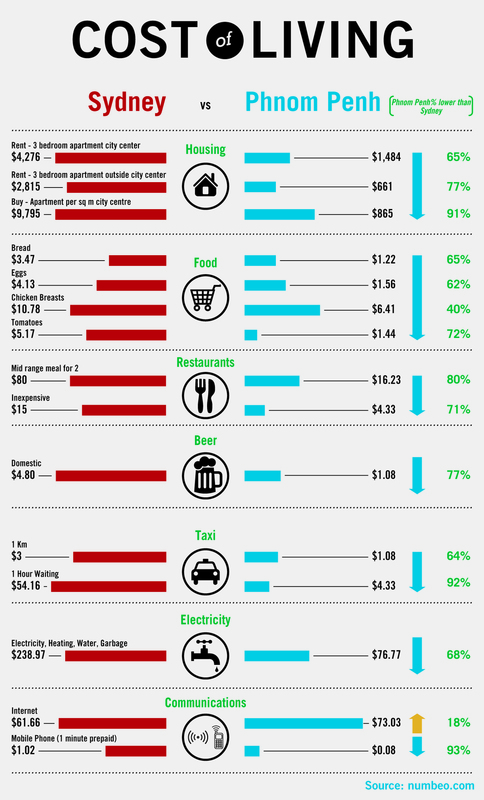 A mid-priced restaurant is 80 per cent cheaper than in Australia. Taxis are very cheap – fares are 64 per cent less than in Sydney and waiting time charges 92 per cent lower. Electricity is 68 per cent cheaper and mobile phone (prepaid) costs are 93 per cent lower. Internet costs though are steep, although they are still less than in Australia. Alan believes that a single person can easily live on A$1000 a month. For Joanna, it’s more like $2000 a month. While Ted said that a couple would want A$3000 a month to live comfortably. It all depends on how you live, really. Despite personal variations, it’s clear that living in Cambodia is well within the reach of Australians, even retirees who are watching their budget.